Alex tracks down his mother and finds that she's healthy and happy. He hugs her for the first time in years. Grey's Anatomy Season 14 Episode 22: "Fight For Your Mind"
Amelia: I'm not ignoring you. I'm ignoring the demon. Hellmouth: Any minute now she's going to figure out I am the love of her life. Dahlia: Meredith Grey is straight. Hellmouth: Ever hear her talk about Cristina Yang? Permalink: Ever hear her talk about Cristina Yang? 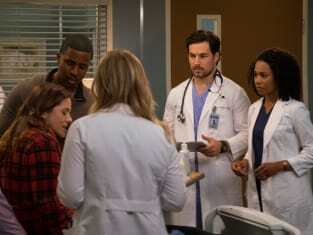 Grey's Anatomy Promo: Are You Ready to Meet Alex's Mother? !